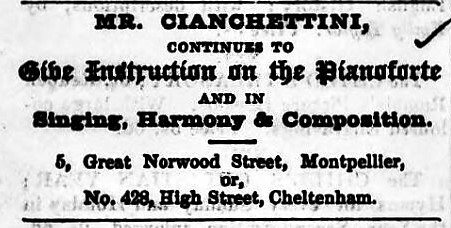 In 1843 the Cheltenham Looker On newspaper reported that the house had been taken by Mr & Mrs Cianchettini. Pio Cianchettini, who was born in London in 1799, was a celebrated music performer and teacher. He had been playing the piano forte and conducting fashionable, popular concerts in venues such as the Assembly Rooms and the Montpellier Rotunda, since at least 1821. Pio and his wife Emma Athanasia were here until 1847 when they moved to Gratton Terrace, where she sadly died two years later aged just 28. 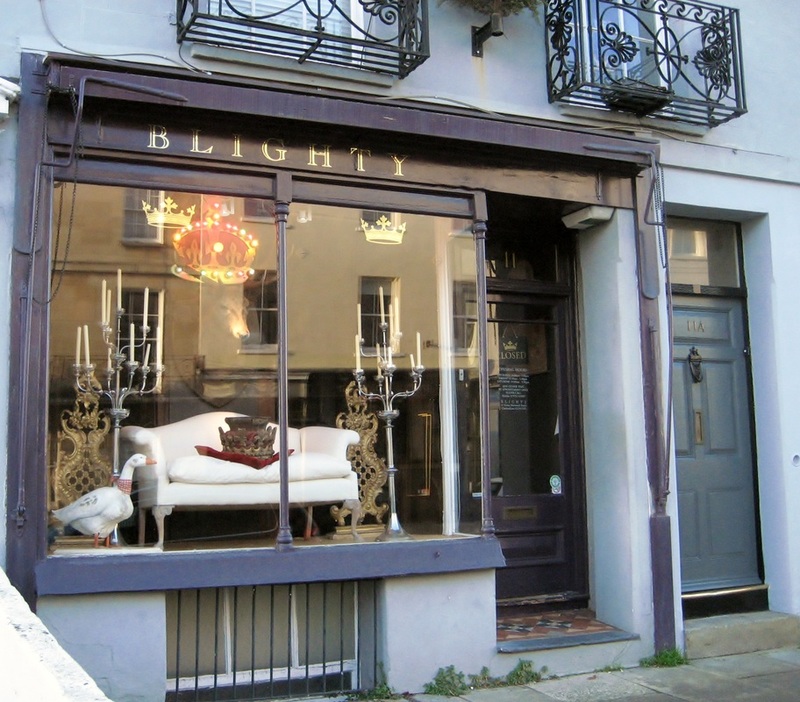 By 1845 the shop part of the premises was occupied by Mr C. Brimall, a gentlemen's tailor, from whom it was possible to buy a pair of buckskin trousers for 21 shillings (£1 and 5p). The trade changed again by the time of the national census in 1851, when the named occupier was Mr Robert Smith, a pianoforte maker. From 1857 to 1871 Joseph Davis, a decorative painter was here. He was followed in about 1888 by Alfred A. Hall, a house decorator and in 1889 by the grandly named "British Window and Step Cleaning Company". 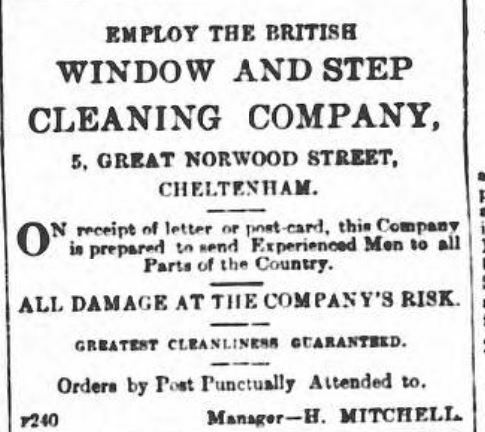 They offered to send experienced men to all parts of the country - it seems rather a long way to go to clean windows. This company was no longer here within three years and was succeeded in 1891 by Geoffrey Eves, a tailor, who was here until at least 1897. ​By 1919 there was another trade at this address in the form of Charles Stevens electricians. 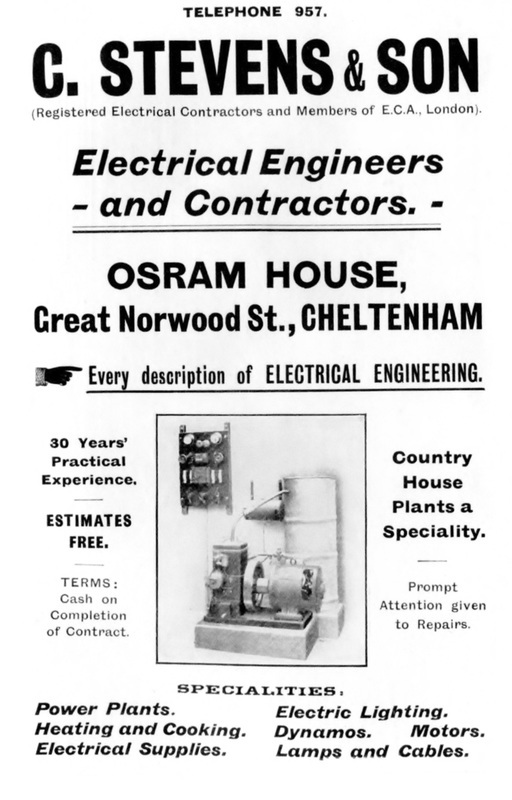 This company later became C. Stevens & Son, Electrical Engineers and Contractors and this property was renamed Osram House. The word Osram is a hybrid of the names of two filament materials, osmium and wolfram (or tungsten as it is now known). It was registered on April 17, 1906 with the German Imperial Patent Office in Berlin as the trademark for “electric incandescent and arc light lamps”. ​By 1933, still using the address Osram House, the Stevens' had been replaced by Mr F.R. Homer, a radio and electrical engineer. ​Then came two hairdressers, first in the late 1930s there was Henry Lurd and from about 1948 to at least 1975 Ronald Margetts. 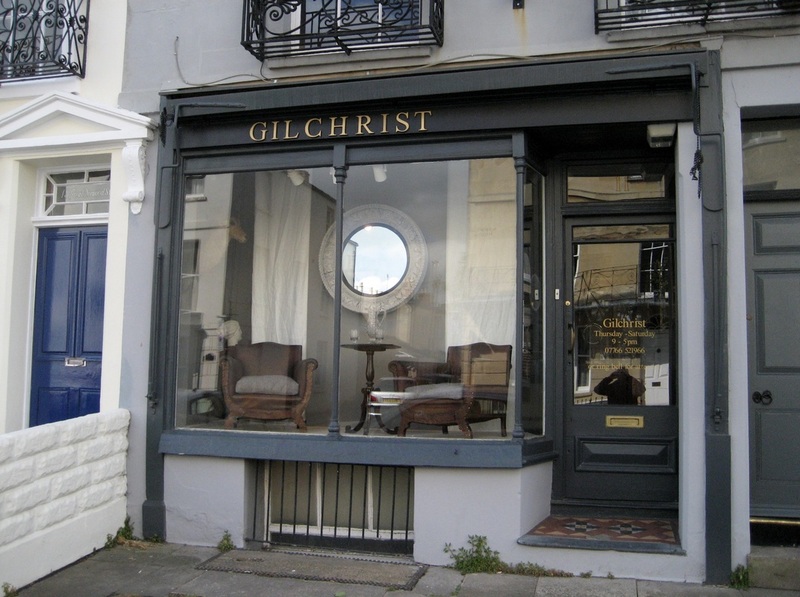 In the early years of the 21st century this became Blighty antiques and that trade has continued after the shop changed to Gilchrist in 2015.